Transport Department at Delhi has an online system to validate the Pollution under control certificates of vehicles plying in Delhi. It is currently not equipped to send e-challans for vehicles who do not renew there PUC certificates within the validity period. In general traffic challan is only issued to a vehicle when the transport department conducts a drive to check the PUC's of vehicles. Delhi government's has suggested that the fine for the PUC violation be increased from Rs. 1000 to Rs. 5000 for the first offense and Rs. 2000 for the subsequent offense. It has also suggested that the department makes use of its online database to send out e-challans to all violators whose renewal status remains pending beyond the grace period. Transport department is apprehensive about sending e-challans as it says that Delhi has over 92lacs registered vehicles and it is an humongous task to send postal challan to everyone violating PUC norms. 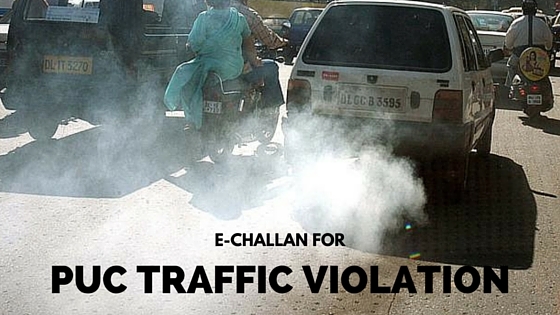 The bigger challenge lies in enforcing the rule by asking the vehicles which have violated this traffic rule to pay the e-challan. With limited resources at its disposal the department finds it challenging to implement this facility. The department was also suggested to send digital challans to the vehicle owner but has said that it does not have the required infrastructure to support it. Most of these vehicles have to be checked for emissions every 3 months while the vehicles bought after 2010 and are BS IV compliant need to get there vehicles checked once every year. In general compliance rate is very low. With 150 staff personnel Transport department had issued 50,000 PUC challans last year.